Use your slow cooker to roast beets. It’s easy! We teamed up with our brand partner, Josie’s Organics, to show just how easy it is to roast beets using a slow cooker. Remove beet greens, leaving about 1 inch of stem affixed to the root. Save beet greens for another use. Place beet in the middle of an aluminum foil sheet. Drizzle with olive oil and sprinkle with salt and pepper. Wrap up tightly in foil. Place wrapped beets in Crock Pot and cook on high for 3-4 hours. Remove from Crock Pot. Rub beets with a paper or cloth towel to remove skin. Dice and serve. Optional: Top with your favorite herbs, like thyme, tarragon, parsley, or oregano. *You can make as many roasted beets as your slow cooker can hold, generally about 2 bunches. Wrap each beet individually in aluminum foil. You’ll notice that we recommend roasting the beets with their skins on. If you’d like to remove the skin before serving, wait until after the beets are cooked and remove them by rubbing them with a paper towel. The skins will peel right off. This is easier and less messy than peeling raw beets. Plus, it wastes less of the beet — and reducing food waste and improving sustainability is something The Produce Moms and Josie’s Organics believe strongly in. Roasted beets make a delicious side dish, but don’t stop there. Just like raw beets, roasted beets add exciting flavor and texture to any salad. One of our favorites is Navel Orange and Beet Salad. Add roasted beets to potato salad for a burst of sweetness and color. Josie’s Organics suggests serving roasted beets on a bed of chopped beet greens topped with crumbled goat cheese, roasted nuts, and a drizzle of balsamic glaze. Yum! 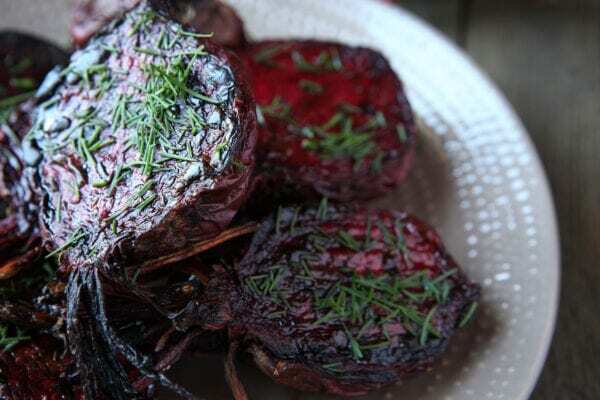 Storage Tip: Slow cooker roasted beets can be made ahead of time and stored for later use. If you don’t plan to serve your roasted beets right away, place them in an airtight container and store them in the refrigerator for up to a week. How do you like to enjoy roasted beets? Share your favorite serving suggestions in the comments below.